Today's technique comes from a card that I made for the Special Folds Swap at Convention. I first saw it on a website with a pattern that you printed out and cut the hearts out. I immediately thought that I could do this using Stampin' Up! 's Heart framelits and they worked perfectly! This card is also a great one for the Big Shot Magnetic Platorm which should be available again shortly. It works so well to hold the framelits in place as you cut the hearts. Let's get started. Here's what you will need. I have put everything down to finish the card. For ease in figuring out which hearts to use, I am numbering them beginning with the smallest being (1) and the largest scalloped heart as (6). Cut one piece of Pink Pirouette cardstock at 5 1/2" x 11". From the scrap of that piece, cut the 2"x4" piece. From the second piece of Pink Pirouette cardstock, cut at 4"x8 1/2". Using the scrap pieces, cut Hearts (2) and (4) from the smaller piece and Scalloped Heart (6) from the larger scrap. 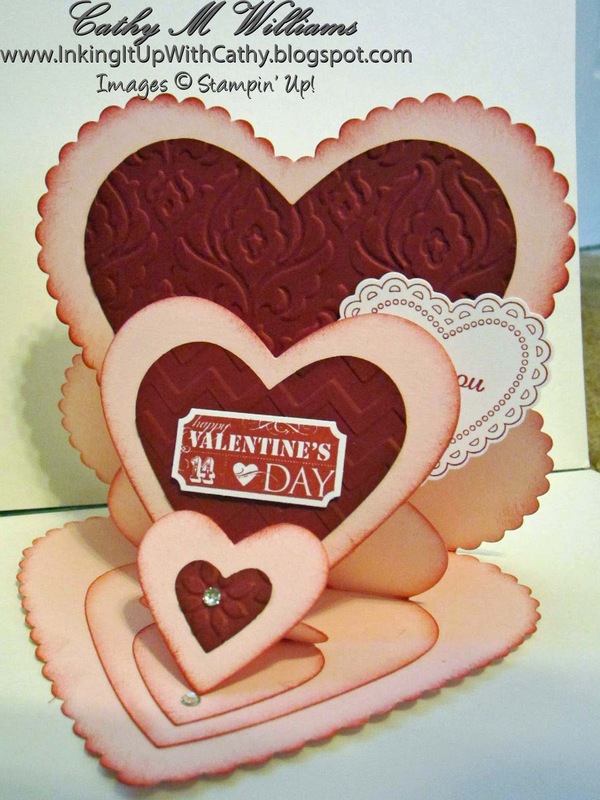 Using the Raspberry Ripple cardstock, cut out one of each of Hearts (1), (3) and (5). Take the 5 1/2"x11" piece and fold it in half to create a 5 1/2" square. Place Heart (6) on the cardstock with the folded line at the top with the top three scallops over the edge so you retain the folds on each side. Fold the 2"x4" piece and the 4"x 8 1/2" piece in half and cut using Hearts (2) and (4) leaving a bit of the fold at the top as you did with the Scalloped Heart (6). Here is what you will end up with - Hearts (2), (4) and (6) singly and also folded in Pink Pirouette and Hearts (1), (3) and (5) in Raspberry Ripple. Run the three Raspberry Ripple hearts through the various embossing folders. I used Petals-A-Plenty on the smallest, the Chevron on the middle one and Beautiful Baroque on the largest. Line up the fold mark at 1 1/2" and SCORE on the middle heart. Line up the fold at 3/4" and SCORE on the smallest heart. Sponge the edges of the Pink Pirouette hearts on the insides and the fronts of all pieces. Place liquid glue on each of the folded hearts ONLY BELOW THE SCORE LINES. Place the single layer hearts on top of the folded ones as shown. Glue the corresponding Raspberry Ripple pieces to the front of each of the hearts. Place glue on the back of the middle heart and place on the INSIDE of the largest heart with approximately 1/2" showing on the sides near the point of the heart. Place glue on the back of the smallest heart and place on the INSIDE of the middle heart with approximately 1/4" showing on the sides near the point of the heart. Place a large rhinestone near the point of the heart on the inside. Here is the card closed with the finishing touches. The heart from Hearts A Flutter was stamped and cut out using the coordinating framelit. 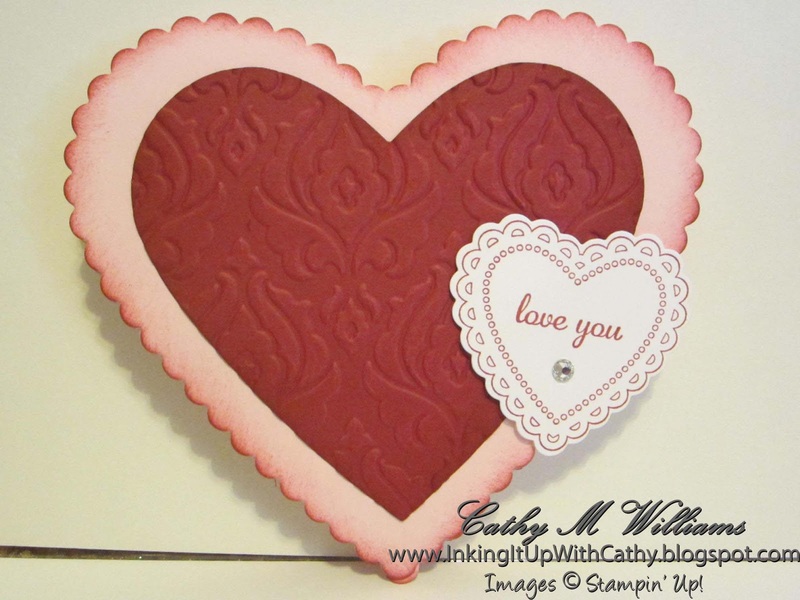 The "love you" comes from the Express Yourself stamp set and a rhinestone is added. Here's the card all opened up. The groove created by the opening at the top of the smallest heart and the middle heart create a place for the middle and largest heart points to sit down into. The middle heart was decorates using the That's the Ticket stamp set and the Ticket Duo punch and the smallest was decorated with another rhinestone. What set of hearts did you use? I love the card. The set of hearts I have don't have the scalloped. Thank you Kathy! They are a retired set from Stampin' Up! The post is from 2013 and they retired a few years ago. You may be able to find them on eBay or another company may have scalloped hearts. Sorry I couldn’t help more.